Every Monday I put on my supermom cape and head to Costco, (and pray my preschooler won’t need a bathroom break until we get home!). Then while he naps in the afternoon, I spend at least an hour chopping and prepping my family’s fruits and veggies for the week. I do laundry and try to put the house back together after everyone being home for the weekend. I love “starting my week off right”, and know that the entire week will be better if I tackle Monday and get all my errands and housework done before the week starts to wear me out. Several months ago a beautiful meme popped up in my Facebook feed. It said “Postpartum is a mother’s Sabbath, a time to rest, be thankful, and revel in the glory of new life”. The truth and beauty of that quote struck me and sent me into an afternoon of contemplation. I love the powerful analogy it provides. 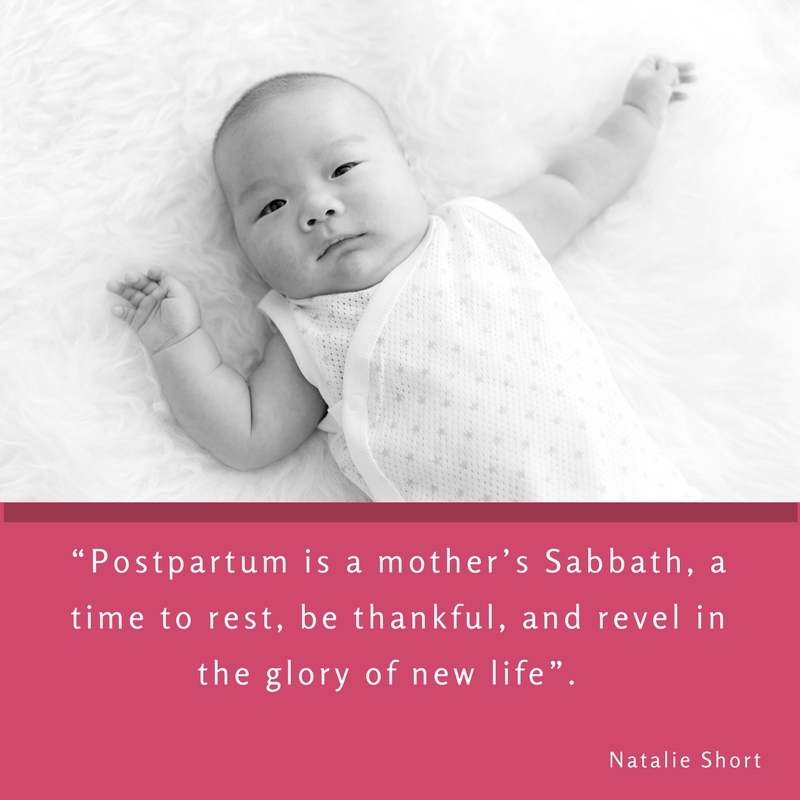 Despite my experience as a mother, a childbirth professional, and a Latter Day Saint, I have never considered the postpartum period to be Sabbath-like, but I think I will always consider it that way now. I can’t help but wonder how different the postpartum period (the first 6-12 weeks after giving birth) would be for mothers if this was how we all viewed it. Would mothers give themselves permission to truly rest? And would others enable them to do so? For many women, there are internal and external pressures to return to daily tasks like cooking, cleaning, taking care of older children, and even returning to the workforce shortly after welcoming a new baby into their family. It’s difficult to allow ourselves to truly rest, especially when our households rely on our physical and financial contributions. But neglecting the postpartum period and refusing to slow down and recover from birth interferes with mother-infant bonding and increases a woman’s risk of poor physical recovery and postpartum depression. 1: It should provide rest and respite from daily work. Mothers should not be doing any chores or meal prep during the first couple weeks after giving birth (even longer for some women, particularly those recovering from a cesarean or a difficult birth). Though some will want to get back to their to-do lists, doing too much too soon leads to a longer recovery period. It goes against our culture to slow down for more than a day or two, but it is needed and crucial for physical healing and emotional health. 2: It should inspire and spiritually uplift. Since mom should be resting and spending much of her time in bed with her newborn, she can focus solely on bonding with her child and enjoying her special time to do so. Bonding and resting without daily distractions is a gift that will only last for a short time, and should be treasured by the mother, and encouraged by her support team. But it won’t be treasured if mom is trying to do it all, and is only able to give a part of herself to her newborn. This is a great time to sing primary songs to your baby, listen to an uplifting podcast, and fill your own spiritual and emotional cup. Spending a few weeks snuggled up to someone fresh from heaven is bound to inspire and uplift if there are no outside pressures or distractions, and lots of support. 3: It should be different from other days. Women should not expect themselves to return home from giving birth and immediately pick up where they left off. (It’s the Sabbath, not Monday!) The postpartum period should be starkly different from everyday life. Work should be done beforehand to ensure that the Sabbath can be peaceful and free from tasks. Essential baby projects should be done before the baby is born. The last thing a mom needs to be doing is painting the nursery several days after giving birth. If tasks cannot be accomplished before the birth, then parents must agree to not finish them until several weeks or even months after the baby is born. Dad can certainly take over painting and crib assembly after the birth, but that will take him away from being able to take care of his wife and older children. The Sabbath is always better when we are prepared for it. When we are frantically preparing our lessons during sacrament meeting, we aren’t getting the blessings of truly being edified by the meeting. Likewise, if mom is stressed and anxious because her house is not in order for her baby to arrive, then she will feel restless and discontent during her postpartum period, and miss out on some of the joys of truly being at peace and living in the moment with her newborn. Marie is an advanced certified doula, childbirth educator, mother-infant health advocate, and mother of 4. To learn more about adding doctrinal teachings to your pregnancy, birth, and postpartum, check out her book “The Sacred Gift of Childbirth: Making Empowered Choices for You and Your Baby” or visit her website www.MarieBigelow.com.